Saturday October 24th 1896 I was busy with the work all forenoon. Will took corn to the valley and went to town after dinner. I sewed on my quilt. Sunday October 25th 1896 It was a nice day but we did not go away from the house. Will had all the work to do. I read and wrote and had a good rest. Monday October 26th 1896 I was busy about the work all forenoon. After an early dinner I began to work on my quilt. The folks were out from home to spend the afternoon. fine day. Tuesday October 27th 1896 The work kept me busy till dinner time. I went down town in the afternoon. I met Mother at Otts office and we went up to the cemetery and called on Mrs Cavanauh. I did evening work after coming home. Wednesday October 28th 1896 It was actually warm today. I washed windows and did baking and made pressed chicken. Will took two loads of corn to the valley. I worked some on my quilt. 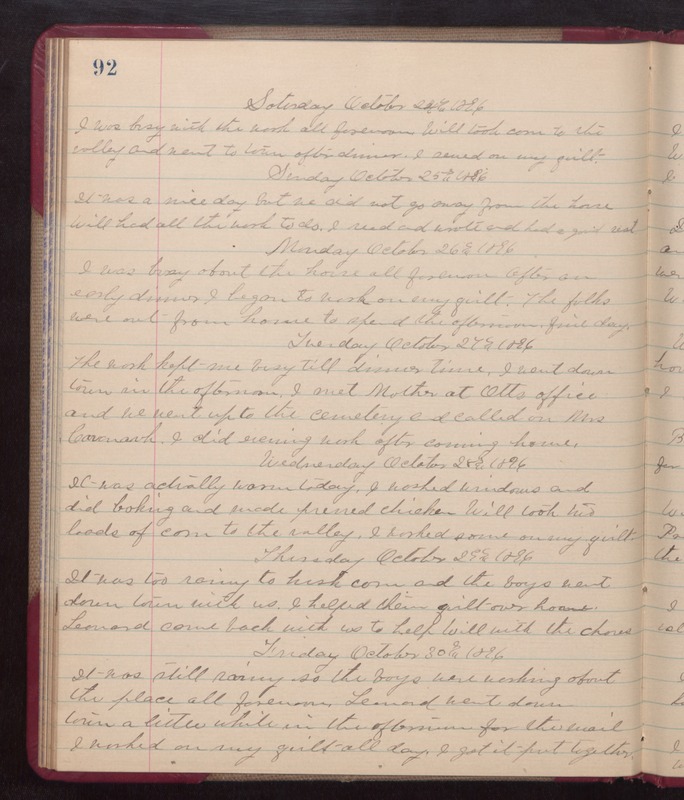 Thursday October 29th 1896 It was too rainy to husk corn and the boys went down town with us. I helped them quilt over home. Leonard came back with us to help Will with the chores. Friday October 30th 1896 It was still rainy so the boys were working about the place all forenoon. Leonard went down town a little while in the afternoon for the mail. I worked on my quilt all day. I got it put together.